Kayak Season Comes to A Fitting End: 4D Squared. If you want to soar with the Eagles, don’t hang around with turkeys. 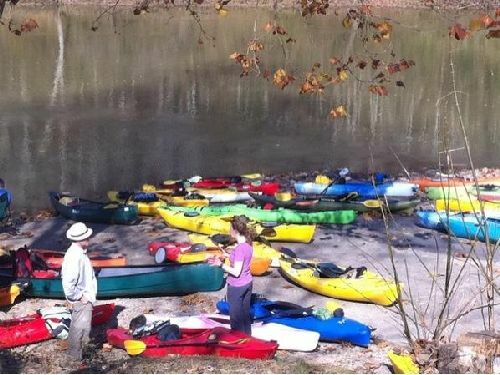 Saturday was probably the last big meetup of the kayak group I’ve been running water with since spring. There were 36 of us. As you can tell my the collection of yaks, we are a pretty conservative bunch. Since Saturday was the first day of Killing Bambi’s Mom season, more than a few wore brightly colored clothes: vest and hats. As if that floating kaleidoscope could be mistaken for a herd of meat on the hoof. We all meet at the put-in and then run cars back and forth to the take out. Those from far away are free to vamoose from the take-out and others throw 3 or 4 kayaks in or on a vehicle and tote people back to the put-in. Luckily, others are in charge of that! The only time my Paddle Buddy and I attempted a trip together without the group, it didn’t end well. What a beautiful day to be on the water. It was mid 70s, sunny, blue skies and EAGLES above. We put in at the tail-waters of a dam that makes a large fake-lake. The eagles like to hang there during the winter. The kaleidoscope hit the river and since I was one of the first to arrive my yak was near the water so I was near the lead of the yak-pack. The water was being released from the dam to take the fake-lake to “winter pool” so it was moving pretty good. Perfect day for a 15 mile float. Even though everybody said it was a great day for a leisurely trip, I soon was bringing up the rear. My Paddle Buddy kept pace with the group. They actually were paddling! No problem for me. I like the solitude and quietness of floating along – usually backwards. For some reason my kayak likes to go backwards if I’m not paddling. Since the leaves are gone, I could see to the top of the huge bluffs along the river. Sights I hadn’t seen before. I have mastered a new skill with which I take much pride. I now can now stand up in my kayak to pee! Yeah, well it is a big deal. When both sides of the river are rocky bluffs and the river is up, the sand or gravel bars are hard to find. And since the water is mid 60s temperature I really wanted to keep my tootsies dry. When I found a sandy area, I got up a great head of steam and beached the front third of the yak. Then. THEN, stood up and raised the water level. Of course this put me even further behind the main group. ‘Round the next bend they had stopped for the same purpose and to have a snack and yak. I stopped for a few minutes, but since I had done my thing, I told my Paddle Buddy I was shoving off and continuing my float. My exact words were “as if anybody cares, I’m going on ahead.” That brought a suitable response. Eventually they all caught up. You know how voices carry on water and echo off bluffs? It sounded like a gaggle of geese coming after me. Zoom … and I was alone again. I kept them in sight but eventually all I could see was the flash of a paddle when the sun hit it. Meh. I’m fine, river is good, I’m experienced, have my personal flotation device, so I floated. Then I realize the group of 6-8 kayaks I saw were in the middle of the river – around a log. This is odd, because on the river, the idea is to avoid half-submerged logs and trees in the river. They are dangerous. He had been “swimming” and the group was helping him recover. 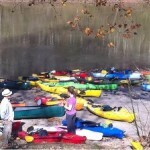 He was furiously pumping the water from his kayak as others offered dry clothes, moral support and encouragement. As I floated quietly past, not saying a word, PB got back in his kayak and headed to the bank to change into dry clothes and finish evacuating the water he trapped in his yak. PB spent his youth as a Coast Guard Search and Rescue dude on the Great Lakes – in winter! His nickname is Doc. It was 4D squared. Da Day Doc Dumped – twice. After about an hour of floating and them not catching up, I got worried because PB has a bad ticker. But about a mile from the takeout I could hear them coming. He was fine. As we stood on the bank with his kayak standing on end to get the last of the water from his craft, we were shielded from the group. “I was embarrassed,” he admitted. However… he never did admit that to me that he swam twice. Old Coasties still have a lot of pride apparently. OK then! Let the razzing begin. It’s going to be a fun winter as I remind Doc of 4D squared. Even though I was there, I still hung on every word to see your perspective of the trip…fun day on the water. Hope you don’t let the beauty of winter paddles pass you by as you piddle indoors. @Maryellen: thanks for commenting! I’ll be paddling this winter, but it will be in warmer climates! Unless we get one of those rare 65 degree days on a weekend in Feb., I’m pretty sure I’m done. I enjoyed reading about your day on the water. Not something that sounds fun for me personally, which makes reading about your day all the better. Glad your knee must be doing better. Lynn’s are doing good too, although, I don’t think he’d be up to that.